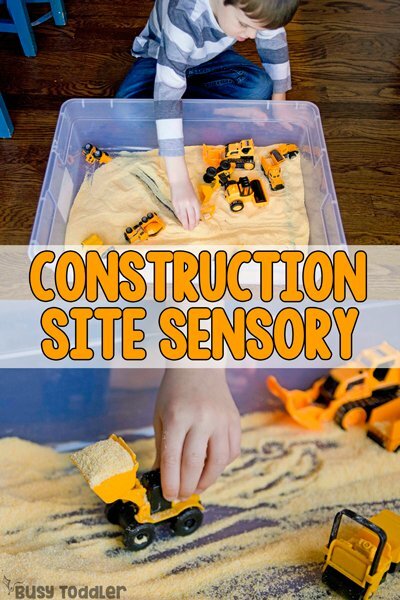 No matter their age – your kiddo will love this cornmeal construction site. The number one question I get about sensory bins is “Are they super messy?” The second most asked question is “Will my toddler eat it?” And the third most asked question: “Is my child too old for sensory bins?” And that’s what we’re talking about today. 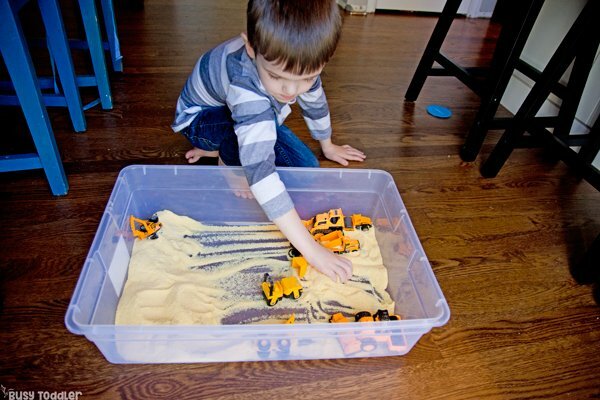 Is your child too old for sensory bins?? In a word, no. But I’ll give you more than words. 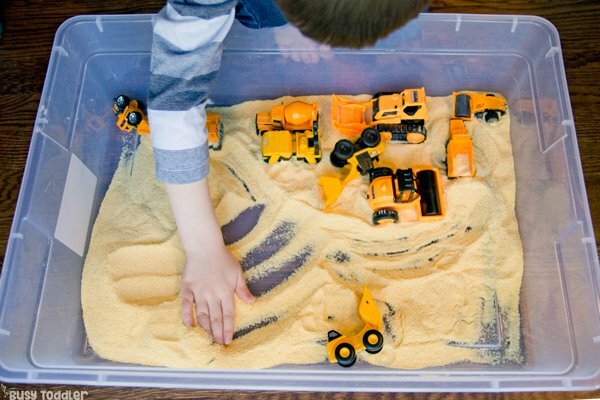 I’ll give you the love story of a 5 year old and his favorite sensory bin: a simple cornmeal construction site. I always tell people how magical sensory bins are – there’s just something about them. One of the most magical things about sensory bins is that they are ageless. 13 months old or 13 years old: I’ve seen both play with the same sensory bin at my house. There is just something about sensory bins. 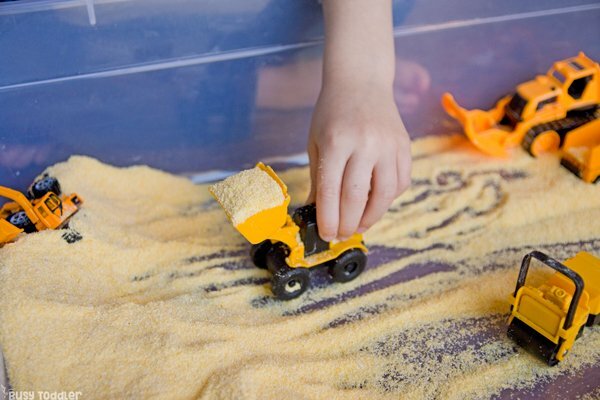 And this cornmeal construction site is absolutely perfect for any age. 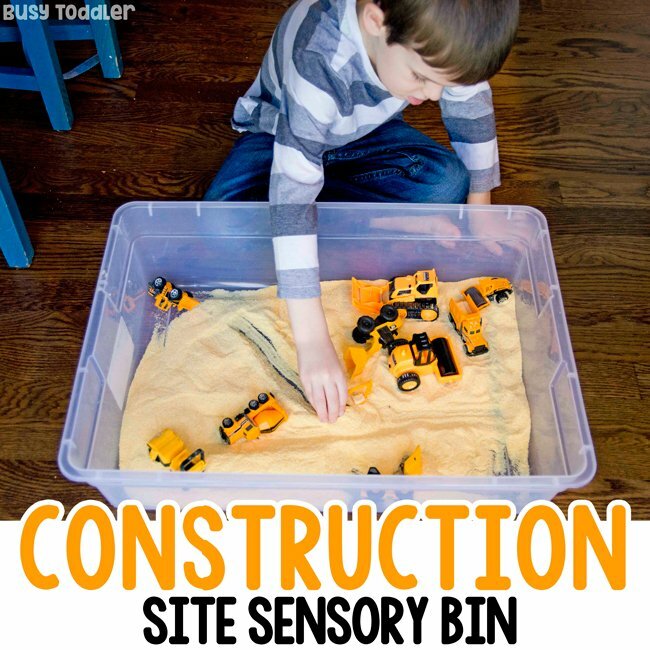 This is probably one of the simplest sensory bins to set up but it’s a timeless classic. What does my son do with his bin? He’s himself, fully and wholly when he is playing with this sensory bin. He plays for HOURS with this and I’m not making that up. He’s 5 years old and he will play with this all day. He builds imaginary construction sites and works on imaginary jobs. He adds in toys, takes out toys, and makes tasks for himself. He learns about cause and effect, problem solving, works on fine motor skills, and develops his independent play skills when he’s playing with this bin. He might not being a young toddler just learning about the world, or trying to discover what it means to “dump” or “pour”, but he’s still learning so much for a few pounds of cornmeal (that may or may not be about a year old…). 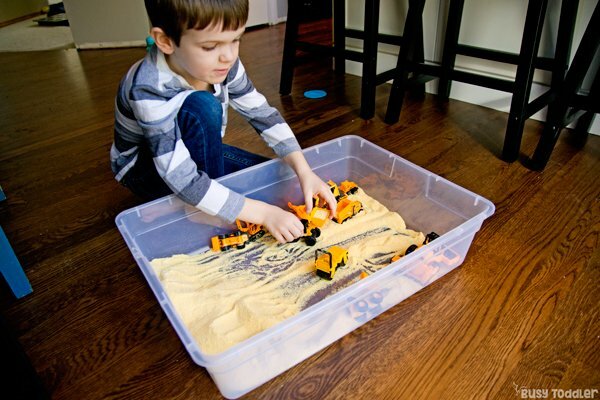 If you are on the fence about sensory bins, especially worried your child is just too old now, they aren’t. 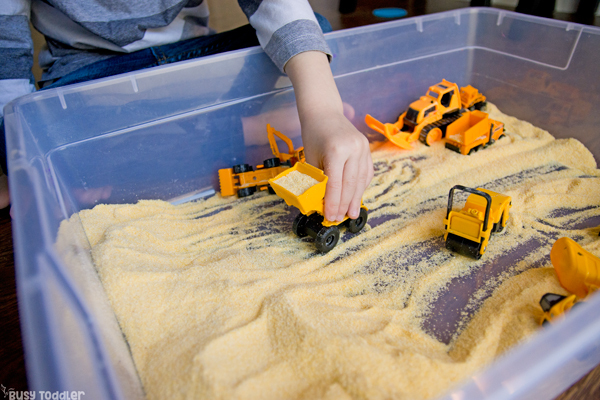 Sensory bins have a way of capturing the attention of almost every child who touches them. From my 21 month old to my 10 year old neighbor – sensory bins brings kids together. They’re a powerful equalizer. 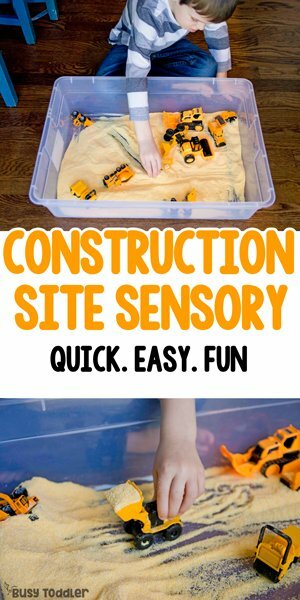 Making a cornmeal construction site takes just seconds, but your child will play for so much longer than that with this sensory bin. It may not have a bunch of fancy bells and whistles, but it’s every bit as awesome as any other bin. When will you build a cornmeal construction site?